Photo booths are all the rage! Skip the pricey photo booth rental fees and set up a fun, personalized photo backdrop by Kate Aspen. With its red and white gingham print and grilling utensil graphics, this barbecue-inspired photo backdrop will allow you to capture wonderful memories at your barbecue party or baby shower picnic. 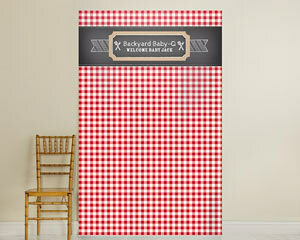 Simply customize this backdrop with a special message or event details, grab some props and let the good times roll! Your guests won't want to leave without taking, at least, one snapshot. Suspension Options: Option 1: Mount the backdrop to a wall surface using Command Picture Hanging Strips, available at most craft stores. Option 2: Suspend using clear push pins into the wall. Option 3: Use portable banner stand. Mounting supplies are not included with the backdrop.